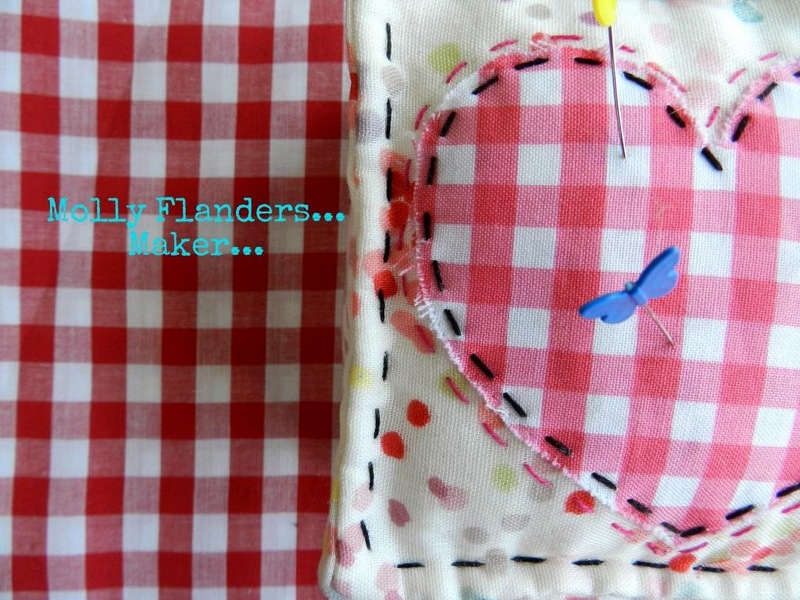 Molly Flanders: A Tutorial: French Binding...Ooh,la,la! There are many options when adding binding to your quilt....I have had a lot of success using a French Binding and here is the method I use. To begin I measure the perimeter of my quilt top and add 10 inches to that measurement...that will be the amount of binding I will need to cover the quilt top. Sew the strips together by placing two strips perpendicular to each other and right sides facing...draw a line from the top left corner to the lower right corner. Stitch all strips end to end in the same manner. Fold the strip together again...this will become a pocket a little later. You will begin and end stitching at this point. Begin sewing (1/4 inch seam allowance) with the binding open. Mark with a pin 1 inch past where the bottom of the folded corner meets the binding strip. Stitch from the top of the binding to the pin - which is marking the 1 inch mark. Now you have created the pocket where the end of the quilt will be tucked in! Then fold the binding back down. Start stitching again a scant 1/4 inch from the corner. Now the binding will be added to the next side of the quilt. Repeat this for all four corners of the quilt. Stitch from the where you stopped to the point where the binding is stitched together with both layers....fold the binding over to the back of the quilt and stitch by hand. Great tutorial thanks, and a super-sweet quilt! Hi Mary, I just found your site. Love it and love your style! My binding is exactly the same way! Thanks! Alia in Muscat and I agree with Bellgirl; this quilt is so sweet! Hi Mary i just used this tutorial on a dolly quilt and it is fantastic! Thanks for sharing it - i am converted!! Thank you Mary. I was having trouble with my corners. I am using your tute again today for binding! Had to refresh my memory on the pocket. I just love the "no math" way of joining the ends! Tuck in and sew!!! Thanks Mary! This is a great tutorial! I haven't seen this method before. I always struggle trying to get those ends to look perfect and I fail everytime! This is great! Thank you! This tutorial is great! I always have a bit of a fight trying to make the ends perfect! Thank you! Well, well, well...isn't that ingenious!! Thanks for sharing this method!! I will definitely give it a try!! Mary ... That's Brilliant ... I have been quilting for 35 years. It is nice to be able to still pick up a new tip. Thanks. Hello - So I was curious how I do it if I wanted a wider Binding?